This entry was posted in BaseWord on 30 December, 2007 by Erik. A lot of years ago, my sister and I sat in a train, looking at life on the platform, while we were waiting for the train to start moving. We saw an alarmingly fat person with a broom, cleaning up after us passengers. Not thinking twice, I said to my sister – probably a little too loud – “It looks like that man has swallowed a TV”. With us being inside the train, and him walking outside, he shouldn’t be able to hear that. But yet he turned round looking straight at me, with a very sad expression. I don’t know if he heard me, or just happened to turn around and see a very stupid kid (me) sitting there looking at him. Normally I do not make fun of other people. Partly because I don’t like to hurt other people, but mostly because I tend to be a bit longsighted when it comes to people: I don’t focus so much on the exterior; maybe because I’m no model myself. I think that’s the reason why I still remember this so vividly. I really hope you’ll act more intelligent than I did, and treat other people with decency, even if they have flaws and you don’t. This entry was posted in BaseWord on 25 December, 2007 by Erik. This entry was posted in BaseWord on 20 December, 2007 by Erik. 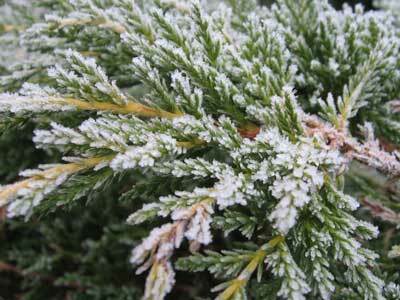 This day started with frosty mist and plants with ice. Though the temperature was above zero (Celsius) when I drove out this morning to go shopping, the roads were very icy because of the mist. This entry was posted in BaseWord, HomeBase on 16 December, 2007 by Erik. God gives all birds their food but does not drop it into their nests.